The figure of a publisher is very important to an artist. Carlo Bellotti Publishing has every interest (Being co-owner of the work and therefore the corresponding economic exploitation) to use your material in many different ways and contexts, taking care of many of the aspects related to the licenses of synchronization, use of music recordings and live performances. Carlo Bellotti Publishing also takes care of protection and legal protection of your work, dealing with litigation, plagiarism, theft, and fraudulent actions that external entities could fulfill toward the artists we represent. Carlo Bellotti Publishing protects the interests of the composer. It may be deduced from this that anyone who wants to use a song in a production must have recourse to the license of the publisher, that is the copyright owner. The proceeds of these licenses are divided (by contract) with the artists we represent. In the absence of publisher the majority of the proceeds earned from you will be “frozen” into the coffers S.I.A.E. or of other companies collecting and many operations will be impossible to bring to term. The first step of the publisher, involves the registration and deposit of the work. The formalization of the authorship of the work allows you to make it publicly available. Carlo Bellotti Publishing exerts a form of bureaucratic protection that the author could not achieve, and allows you to multiply your income because the work edited has a higher value. 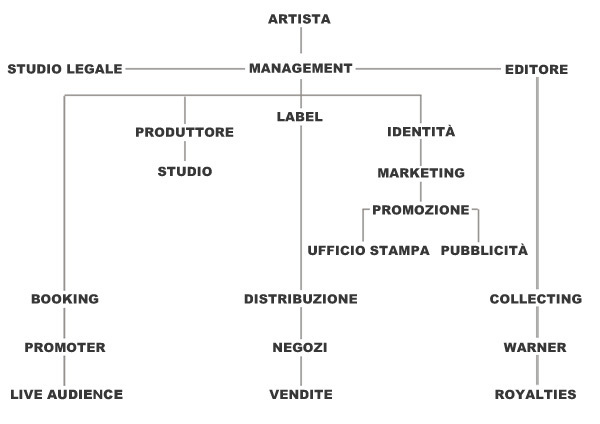 Carlo Bellotti Publishing deals with the storage of work, from the administration and the protection. Thanks to the joint venture with WARNER CHAPPELL MUSIC (Group company Warner Music), and ensures precise collection of accrued benefits in all countries where the copyright is protected. Carlo Bellotti Publishing with WARNER CHAPPELL MUSIC administers the rights to musical work. Our Company administers the rights of public execution of your work, including cinema broadcasting, and mechanical reproduction rights of your work. Also other types of rights are administered, such as those of printed reproduction of any kind and the rights of synchronization. Carlo Bellotti Publishing / WARNER CHAPPELL MUSIC serves as the levying of fees (Collecting) on a specific mandate. Carlo Bellotti Publishing has signed an important agreement of co-publishing with WARNER CHAPPELL MUSIC, lead company in placement of syncs audio/video for the purposes film/advertising and television. Thanks to this important trust Carlo Bellotti Publishing intends to make visible all artists edited by the film production companies and advertising. Thanks to a cd sampler sent to the above case of companies, Carlo Bellotti Publishing ease synchronizations of any type. The creation of an online catalog, which is already active, is the final step toward much-needed exposure for artists in the world of audiovisual production. Thanks to Carlo Bellotti Publishing (company leader specializing in campaigns of license and that boasts more than 500 negotiations brought to term) we multiply the possibility to propose products that we represent to labels and distributions (Italian and foreign). Carlo Bellotti Publishing select the labels on the basis of a deep knowledge of many international catalogs. The work is targeted, accurate and professional, Carlo Bellotti Publishing takes care of every detail presenting the product with the highest professionalism. Thanks to companies such as The Orchard, Mondadori Retail, Aural Music Group and Plastic Head Distribution, Carlo Bellotti Publishing is able to reach, with their products, 30 countries in the world and about 250 digital stores, important mail orders and company stores. Carlo Bellotti Publishing can provide advice on all commercial aspects and management of your products: ISRC, Barcode, catalog numbers etc. In addition our company has a division dedicated to strategic marketing to develop the distribution sector in news stands and other similar initiatives. Carlo Bellotti Publishing is a group of companies who specializes in multi-platform promotional campaigns, management, marketing, production and distribution. We work with European press (operating with partners in every country), radio (national, regional and specialist) and TV. We think each campaign to the specific artist/Label, using an extremely broad database of industry contacts (both national and international). We can offer an exhaustive and innovative independent PR service for upcoming or established artists, labels, Distributors, Producers, Video makers, Agencies, TV Programs, Clothing Brands and Club. Print promotion is one of our priorities regarding all sectors of activity. Regardless whether we are dealing with the relevant music magazines, smaller local papers or glossy magazines, and no matter whether this is about interviews, tour dates or tour presentations, we cooperate with all forms of print media. In general we require promo items 8 weeks before release to get the best results. We’re taking care of a list with a lot Independent – Radio channels and stations including supra regional / nationwide stations, radios under public law / federal state wide stations and local radios, day and night program. If a video release is planned we serve this to the relevant Channels. Tour promotion and appearance in possible (and relevant) TV Shows are also possible from time to time. If Tour plans will be scheduled, we combine the album promo with tour promo. We provide everyone with tour dates and invite as many people as possible. We can also do raffles to get bigger tour announcements. We will also try to get presenters for the tour in combination with the booker. Tour date announcements interviews on tour – all kind of media Live reviews as well as coordination of guest list and if possible interview coordination on spot. We serve the CD’s to all relevant Online Zines / Mags with focus on review, features and interviews. We put a direct link to the Labels Webpage and the artists Homepages if possible. As soon as we have some press statements we send them to the client.